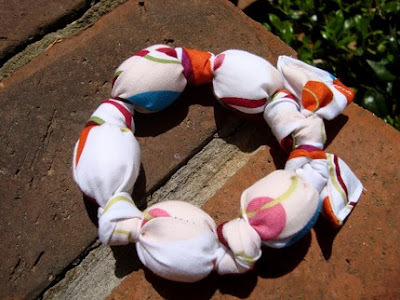 Made of fabric and pompoms, this light weight bracelet measures 8 inches around. 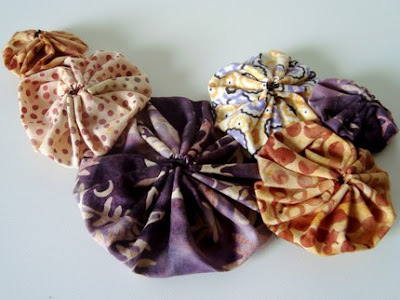 Add a unique look to even the plainest of tops with this 6 inch brooch made of batik yo yos. 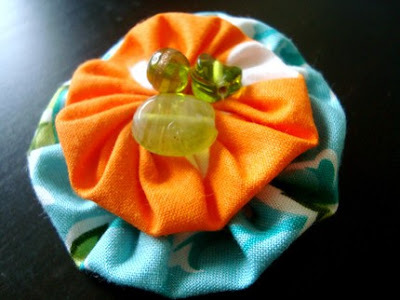 This colorful creation is made of jersey and cotton yo yos. It measures 16 inches and is 6 inches in width. 1. Check out Garden of Eden Designs. Come back here and tell us about your favorite item in the shop. Due to the Labor Day holiday, this week the contest will run until Monday night so you all have a couple of extra days to get those entries in! The winner will be announce on Tuesday! I like the begonia broach best for me... but for my sister, omg so much! she's turning 21 so she needs the bday mask/pin. also she's an EK (sigma kappa) and there was an EK pin featured! cute! These are very cute, but I know I somehow can't pull this look off. 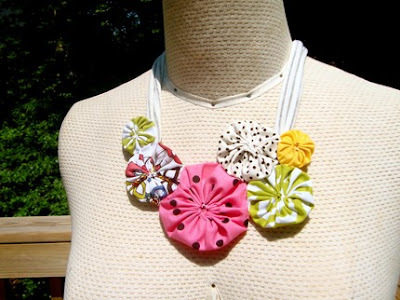 I love the looks of these fabric jewelry pieces though, I'm going to start working myself up to wearing them! And I'm having trouble picking an item. I love the begonia brooch, but I'm more likely to actually wear the anemone tie bracelet... but the bluebell neck-let is nice, too... really, I like anything bright and there's tons of that here. Love her style!! The Eco Friendly necklace is so cute! I am also a follower of your blog now....looks grrrreat!